The stately courthouse here graces the cover of the September issue of Texas Highways. Last month, one of the city's art spaces was featured in Texas Monthly. In June, photos of the historic Carriage District appearing in 80 newspapers via Associated Press celebrated an event on porches of estate homes with music, local wine and demonstrations. Last year, D Magazine in Dallas named Corsicana one of the best day trips. Now this rural city, population 25,000 and about 45 minutes south of Dallas, is ready for its Hollywood close-up. Warning Shot, a movie filmed on location in Corsicana with an all-star cast opening this week, will keep viewers on the edge of their seats. Inspired by true events, the movie features David Spade, Tammy Blanchard, Guillermo Diaz and Dwight Henry with screen legends James Earl Jones, Bruce Dern and Frank Whaley in supporting roles. Warning Shot is the story of a mother trying to protect her daughter while caught in a generations-old cutthroat business rivalry involving water rights. Blanchard plays a single mother with a daughter played by Onata Aprile who struggle to make ends meet until they inherit a farmhouse and 80 acres from family. 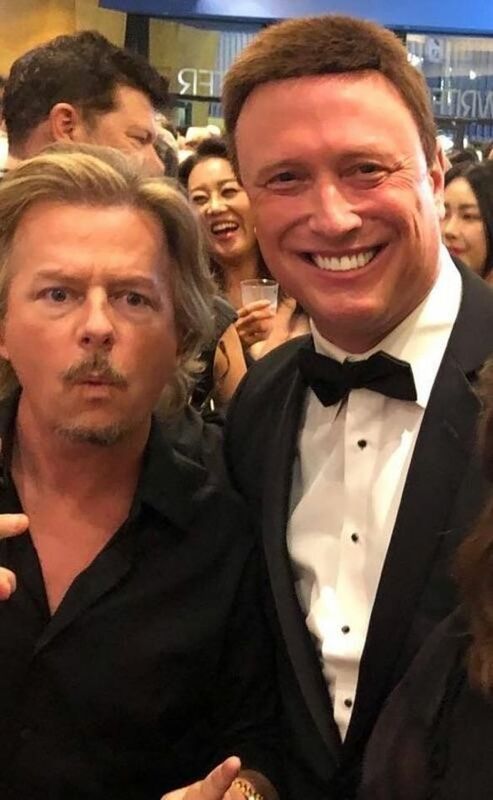 It is David Spade's first dramatic role. Other cast members include Steve Eastin, Niki Koss and Dustie Hale. Most of the scenes, including of the farmhouse and historic downtown, were filmed in and around Corsicana but the bigger story is how Corsicana is featured in the movie. Robert Johnson, an actor, producer and writer with more than 70 appearances and projects is the driving force in bringing motion pictures to Corsicana. Doubling as the city's Chief of Police in real life, Johnson has garnered credits in several Hollywood movies and television shows in the last two years, earning the city the nickname “Hollycana” in production circles for its film-friendly facades and small-town hospitality. Johnson worked as Associate Producer and appeared in the film. He prides himself on insisting the name of the city be included in projects and touts the economic impact of films such as Warning Shot for businesses in town. The movie was produced and directed by Dustin Fairbanks and co-produced by Spero Stamboulis and Will Wallace. Warning Shot was written by Breanne Mattson. “Filming in Corsicana is like going to the town you grew up in where everyone is inviting, embracing and supportive like good friends and family,” said producer Spero Stamboulis. “The community made the experience incredible,” said lead actress Tammy Blanchard. “I am grateful to have experienced the hospitality of the people in Corsicana. It was uplifting and inspiring." During an interview at the Beverly Hills premiere of Warning Shot, Johnson received interest from other directors about filming in the city. It appears that Corsicana is making its mark on the big screen. The movie will open in Corsicana on Friday, September 14 at 7 p.m. at Schulman's Movie Bowl Grille, 3501 Corsicana Crossing Boulevard. Additional Texas screening locations include Hudson Oaks, Palestine, Weatherford, Bay City and Bastrop. The movie can also be seen in select theatres in California, Florida, New York, Georgia, Ohio and Pennsylvania. In Digital and Video on Demand it will be available at Sling TV, DIRECTV, iTUNES, Vubiquity, Google Play, Amazon, Dish Network, Comcast and VuDu. The movie will be also be available through Redbox and at Wal-Mart.